Stickers are not only an effective marketing tool, they are also fun. We all liked receiving stickers when we were kids, and this association has the potential for business owners to create an attention-grabbing marketing campaign. 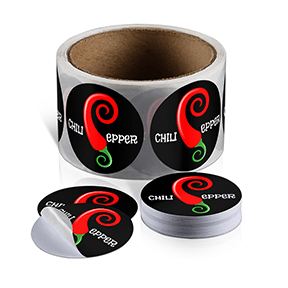 With round stickers, you can showcase your brand logo or use it for packaging your products, or even as envelope seals on your business correspondence. Create a fun and exciting promotion with custom round stickers. The circle shape is printed on the material of your choice with easy crack and peel adhesive backing which sticks to almost any smooth surface. They are available in either individually cut pieces or in roll form, with fully customizable size, paper stock, and coating. All of our stickers are printed in full color, so you are assured that your design is presented in a colorful and attention-grabbing way. Order up to 100,000 pieces. Upload your own design or use our online design tool to create a circle sticker from scratch. With our fast turnaround time, they will be ready for shipping as soon as the next day. Round Stickers is rated 4.6 out of 5 by 38. Rated 5 out of 5 by PDesign from Printed Great! The stickers were printed with accuracy and very easy to take off the roll. They were also packaged nicely where I was afraid they would be "smooshed". Will print again. Thanks! Rated 3 out of 5 by Abby from Off-set printing/cutting My experience with Next Day Flyers was average. First, they did not quality check the stickers they sent. Big bummer. We had an event to prepare for and these stickers were time sensitive. They should have never boxed and shipped what they sent. They did reprint, but it was a hassle. If you're going to order through them, give yourself time in case the quality is off. Rated 5 out of 5 by Artcl from Stickers We ordered the metallic material stickers in 1.75” x 1.75” circle. They are the metallic material and they turned out great. There are some alignment issues as not all are perfectly centered but i can live with that. They have a proffesional look and feel and can not complain about the price. Most other services we have used for commercial needs are two or three times the cost and length of turnaround.